property description: the delightful property of LOV is situated at 800m and lies amongst centuries old organic olive groves, originally planted by the Moors, giving very private and tranquil surroundings. From the poolside terrace enjoy a magnificent view of the southern slopes of the Sierra Nevada with whitewashed villages and shady woodlands sweeping down to the valley floor. The cortijo is truly idylic in its setting with each season bringing its own delights.This is a place to be for a totally relaxing and stressfree vacation. 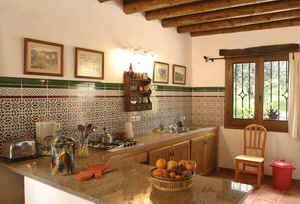 The cortijo is very light, spacious, well equipped and with its love to detail offers a warm welcome. The thick walls, double glazing and insulated roof ensures a cool house in summer and a cosy warm home in winter. Easy access to high mountain tracks, beaches and Granada. The helpful but unobtrusive owners live nearby if help is required. The large, partly roofed private terrace with barbeque, garden furniture and sunbeds offers stunning views over the sierras. The filtered pool (6m x 4m x 1,9m) is strictly private. On the second terrace in front of the cortijo you can catch the last rays of the evening sun. A potent cast iron wood burner warms the entire home in cooler winter nights. Basic food supplies and organic olive oil are provided along with any amount of organic fruit and vegetables you care to pick. location: There are many leisure activities to do once you get here. Horse-riding, walking, paragliding are all within a short distance. Skiing in the Sierra Nevada or windsurfing are both about an hours drive away. We can arrange massage and reflexology sessions for you. We have various leaflets and books in the cottage to help you find your way around the area. Close to the market town of Orgiva which has supermarkets, banks, bars and restaurants and on Thursday there is a bustling street market. Further afield, Granada and the Alhambra Palace is 1 hour away and the beaches of the Costa Tropical 35 minutes. Prices are for the property per week in euros. A deposit of 150 euros per week is required at time of booking with the balance due 4 weeks before arrival date. 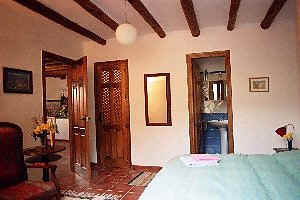 Bedrooms: Los Olivos Viejos features 2 spacious bedrooms, one with a double bed, the other has 2 single beds. Each bedroom has a walk-in wardrobe. Bathrooms: Both bedrooms have their own fully equipped en-suite bathrooms, with bath,integrated shower and WC. Both feature a big window. Kitchen: The open plan kitchen is enhanced by the traditional wooden beam ceiling. The kitchen is very spacious. It offers lots of modern electrical appliances, as a coffee machine, food processor, toaster, gas cooker/oven, fridge/freezer and washing machine. 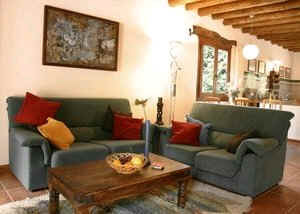 Living Rooms: The lounge area features 2 comfortable sofas ( 2/3), CD and audio tape player,radio and satellite tv. 2 french doors open onto sun terrace, pool area and ´tinao´(open porch). linen/maid service: Bed linen and towels, but not beach towels are provided. They are changed weekly. e-mails sometimes get lost. I answer every request. Please phone if no reply.